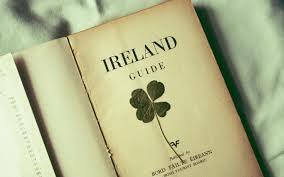 One does not have the last name of Hardie and not celebrate the long held Irish tradition of St. Patrick’s Day! And they played the best games played in Erin Go Bragh. Playing sweet Mauser music for Erin Go Bragh. And placed the machine guns for Erin Go Bragh. Saying, "Give me one hour and I'll blow you away,"
And he died of lead poisoning in Erin Go Bragh. All the dead khaki soldiers in Erin Go Bragh. The red blaze of freedom in Erin Go Braugh. Here are some fun crafts and decor ideas to explore! When you’re planning a holiday party, there’s a lot to think about. For everything from invitations and décor to food, games, and party favors, there are plenty of ideas you can use for your St. Patrick’s Day party. Choose your favorites, and you can worry less about the planning and more about having fun with your friends and family. St. Patrick’s Day CardsFor your invitations, send out a nice St. Patty’s Day card you can print out at home. The card has a nice holiday message on the outside, and you can write all your party details on the inside. It doubles as an invitation for guests and a pleasant holiday card for everyone on your mailing list. DIY Shamrock StreamersStreamers are the ultimate party decoration: they’re cheap, they’re versatile, and they’re easy to hang around the house or classroom. 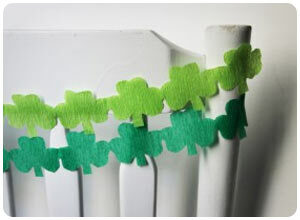 Get some green streamers, and then take it a step further by creating your own shamrock streamers. All you need to do is fold the streamers up, trace a shamrock shape on top of the folded up “stack,” and then cut around the shape. When you unfold the streamers, you’ll have a string of shamrock shapes. Lucky PrintableA print out card is a simple yet stunning décor idea for your party. 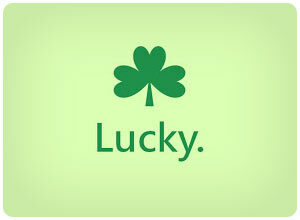 Print out a “Lucky” card or make your own. Just put it in a frame and then call it a day. If you want to get extra creative, you can paint and decorate the frame, too. Turn it into a party activity for kids by purchasing several frames, printing out multiples of the card to put inside each frame, and having the kids decorate their frames to take home. Lucky BingoEveryone loves a good game of Bingo. 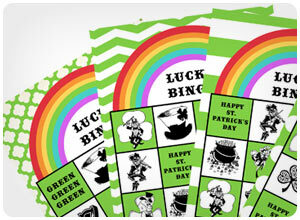 Print out a stack of St. Patrick’s Day themed Lucky Bingo cards for your guests to play at your party. This is a great activity for a party in the home or classroom, and for both kids and adults. For the bingo pieces, you can use small candies or shamrock toys. DIY Shamrock HoneycombsIf you have some honeycomb decorations leftover from the winter holidays, recycle them for St. Patrick’s Day by turning them into shamrock honeycombs. 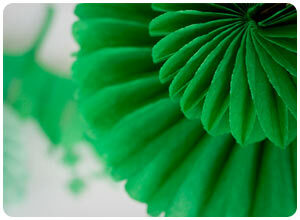 Print out a free shamrock template, and then trace the design on your folded green honeycomb. Simply cut along the lines, and your circular honeycomb is now turned into a shamrock. St. Patty’s Day TopiaryMaking your own decorations is not only cost effective, but it adds a unique, personal touch to your party. A DIY topiary is a great place to start, because they’re easy to make and they look great. 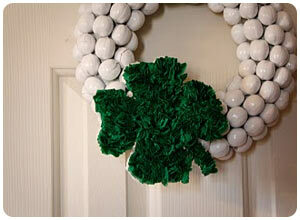 Stock up on some cheap St. Patrick’s Day garland and wrap it around a Styrofoam ball. Use some paint and decorative paper for the container, and get some decorative moss or green tinsel to decorate the inside of the container. Pot o’ Gold Cake BitesThese pot ‘o gold cake bites look adorable and taste fantastic, and they’re an easier St. Patty’s Day dessertto make than you might think. You can make plenty for all your guests to enjoy, whether you’re baking for the kids, their parents, or both. You can go all out with rainbows and marshmallows, or you can simplify the process by leaving out the marshmallows and making smaller rainbows. Kiss Me, I’m IrishIf you’re having a St. Patrick’s Day party, take the theme even further with some “Kiss Me, I’m Irish” food and décor. Using white paper cups, bright green paper, foam dots, some stamps and ink, and various everyday craft items, you can create some adorably kissable décor that’s fun for a kids’ or adults’ party. Lucky Golden RocksDo-it-yourself golden rocks make excellent decorations as well as party favors for each of your guests. 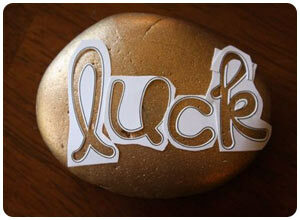 You can make the rocks yourself by spray painting plain rocks gold, and then using letter and shape stencils to paint the word “Lucky” or a shamrock design on each golden rock. Use the rocks as prizes for your party games, and have all your guests take a lucky golden rock home with them after the party. St. Patty’s Day WreathMost holiday wreaths are big and bulky, but this St. Patty’s Day Wreath has a unique but equally festive look for the holiday. 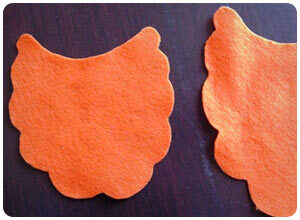 You can make it yourself using scraps of felt and fabric, scissors, hot glue, metal button covers, and clips. Hang it on your door the day of your party, and leave it up throughout the spring. 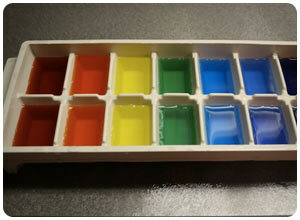 Rainbow Ice CubesFor a kids’ party, rainbow ice cubes are a big hit. You and your kids can make them the night before so the water can freeze overnight. Be sure to make enough for each of your guests. Use clear plastic cups, and serve clear or almost clear juices, sodas, and water so that your kids and all their friends can see the different colored ice cubes in their drinks. 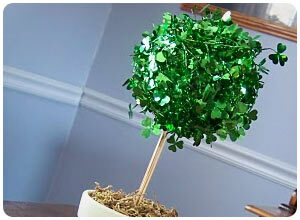 Lucky VaseIf you’re having a St. Patrick’s Day party, you don’t need to spend a ton of money to get great décor. In fact, you can make some beautiful decorations yourself using supplies you probably already have around the house. 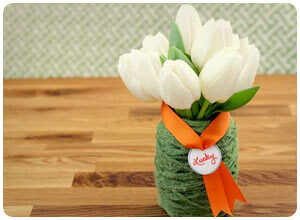 Create a darling vase using a glass jar, green yarn, decorative ribbon, and a paper tag. 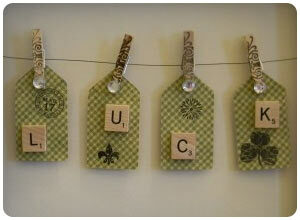 Framed Luck TagsFor some quick and easy yet darling party décor, create and frame some luck tags. Create the tags using decorative paper. Use some St. Patty’s Day stamps to give the tags a vintage festive look, and then glue on some Scrabble tiles to spell out “Luck.” Attach the tags to the frame using clothespins, and display your frame on a bookshelf or over the mantel. St. Patty’s Day Rag WreathIf you’re on a design budget, a St. Patty’s Day rag wreath is an affordable DIY décor option that still looks fabulous at your party. Grab a wire coat hanger and pull it into a circle shape. Then, gather some old scraps of green fabric together to tie around the hanger. Hang it up on your door or over your mantel for a cheap yet chic decoration. 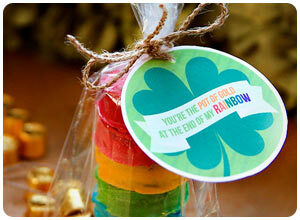 Rainbow Cookie Party FavorsDon’t let your guests leave the party without a goodie bag or party favor. A batch of rainbow cookie favors is perfect because they go with the St. Patrick’s Day theme, they’re easy to make ahead of time, and they’re a fun treat for your guests to enjoy with their families when they get home. 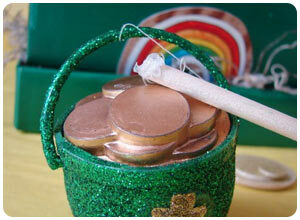 Leprechaun TrapA leprechaun trap is a neat idea for a kids’ party. You can even have the kids create the trap themselves. Have the kids team up to build and decorate their own traps, and the parents can rate the different traps on creativity, how well it works, etc. Have prizes ready to award to each child. Beer Tasting Happy HourIf you’re entertaining for the adults this St. Patrick’s Day, host a beer tasting happy hour at your home. Have your friends bring their favorite brews (bonus points for bringing Irish beers) to share so that everyone can try a little bit of everything. Make some tasty pub snacks, and print out some fun tasting charts so your guests can rate each of the different beers. 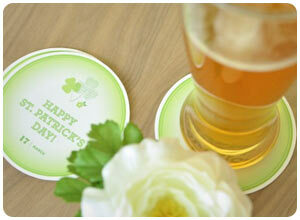 DIY St. Patrick’s Day CoastersIf you’re having a St. Patty’s Day party, you’ll need coasters to house all those drinks. Have some fun and make your own St. Patrick’s Day coasters using a free downloadable design you can print out, plus some paper, thick cardstock or blotter paper, a craft knife, and spray adhesive. It’s a nice touch that your guests will love. Pecan WreathWe usually think of decorative wreaths around Christmas time, but wreaths make excellent decorations for every holiday, including St. Patrick’s Day. This one, in particular, is fun and unique because it’s made of pecans! It’s easy and cheap to make, and it will have all your guests talking the moment they arrive for your party. St. Patrick’s Day DipIt’s not a real party without chips (or crackers) and dip. 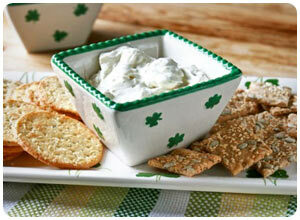 Make your party even more memorable with some yummy St. Patrick’s Day dip. It’s easy enough that you can make it quickly, but different from the usual dips you find at every other gathering. Make it even more festive by housing it in a green St. Patty’s Day bowl. Decorative PlatesMaking decorative plates is a great way to recycle old plates and create some festive décor for your St. Patrick’s Day party. 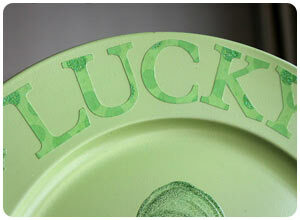 Paint the plates green (spray paint works best, but you can also use craft paint), and use stencils and decorative paper to add the word “Lucky” around the plate’s outer circle. Paint a fun, sparkly shamrock in the center to finish it off. St. Patrick’s Day CenterpieceFor a more elegant take on St. Patrick’s Day décor, create your own hurricanes for a gorgeous centerpiece or mantel decoration. You’ll need three glass vases, three glass candlesticks, craft glue, toothpicks, split peas, and three candles to fit inside the vases. If you don’t already have the candles, vases, and candlesticks, you can find some at the thrift store or dollar store for cheap. 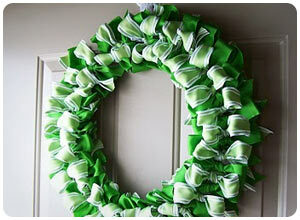 Tulle WreathIf you’re having a St. Patrick’s Day party, make sure the festive decorum starts right at the door. A green tulle wreath is easy to make, and it looks fabulous. Start by wrapping some green ribbon around a straw wreath. 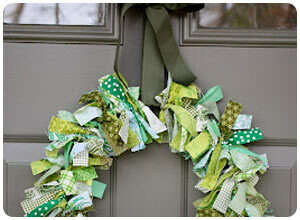 Cut hunter green and lime green tulle into strips and tie the strips in alternating colors around the wreath. 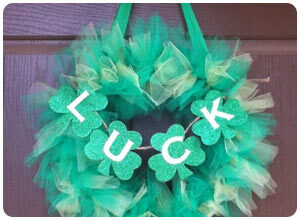 Add a sparkly “Luck” banner to the front if you’d like, and hang it over your door for St. Patty’s Day. Lime CupcakesA St. Patty’s Day party calls for sweet treats in shades of green. 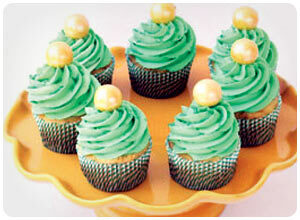 Lime cupcakes are a yummy treat that you can frost and decorate to your heart’s desire. The recipe is easy and hassle-free, and you can decorate each cupcake using a delicious lime frosting, or by adding green food coloring to your favorite store-bought vanilla frosting. St. Patrick’s Day Photo BoothRemember those fun photo booths at the mall? 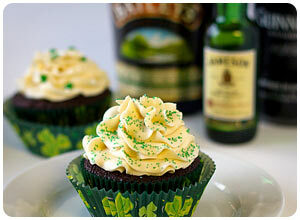 You can create your very own version at your St. Patrick’s Day party, with fun props included. This is such a blast, both for kids and adults, so feel free to get creative with your props. You can find fun items like stick-on mustaches, foam hands, gold coins, and green feather boas for cheap, or you can make your own props such as leprechaun hats, mustache-on-a-stick props, shamrock wands, and more. Leprechaun’s GoldThis fun and humorously frustrating game asks the question: can you let go of the leprechaun’s gold? Guests hold their hands in a specific manner while holding a gold-wrapped chocolate coin (or any coin) between their ring fingers. The goal is to let go of the coin (a difficult if not impossible task when holding the hands together a certain way). It’s a simple game, but it will have everyone talking, trying, and laughing. Follow the Ribbons GameThis game is great fun for both kids and adults. Make it less hassle for the kids, or go crazy with it at a party for adults. Set the game up ahead of time by piling all the “prizes” in one spot and attaching a length of ribbon to each one. Then, twist and tangle the ribbons together, creating various paths around the house—including behind shelves, over doorways, around light fixtures, etc. Starting at the non-prize end, each guest must take a ribbon and follow the winding path all the way to the prize at the end. Boozy Chocolate CupcakesThese boozy chocolate cupcakes are a big hit with adults, so make a batch for your party and your guests will eat them right up. They’re made of chocolate and they house a big surprise—a little bit of Guinness in the batter, a whiskey ganache filling, and some Bailey’s Irish Cream in the frosting. These cupcakes are not for the kids, but your adult guests will love every bite. St. Patrick’s Day Cupcake WrappersDon’t use boring cupcake liners for a holiday party. But also don’t go out and buy expensive themed ones. 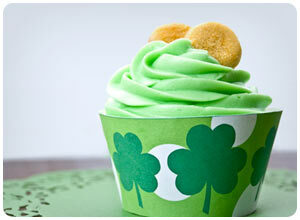 Instead, create your own St. Patrick’s Day cupcake wrappers using your home printer, paper, and a free printable. Once the cupcakes are finished baking and cooling, just wrap the cupcake wrappers around the liners. 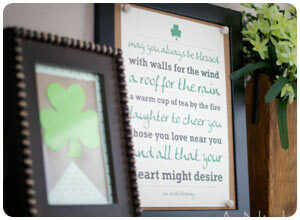 Lucky BannerCreate a St. Patrick’s Day banner for your mantel, shelves, or other areas of your home or classroom to spread some luck and cheer for the holiday. It’s a great decoration to add at the beginning of the St. Patty’s Day season, and you can leave it up for everyone to enjoy at the party. 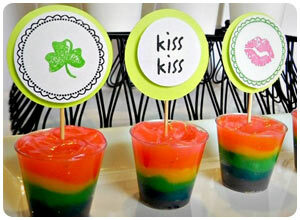 DIY Rainbow FascinatorSo, you’ve decorated your home up nice for St. Patrick’s Day, but what about you? 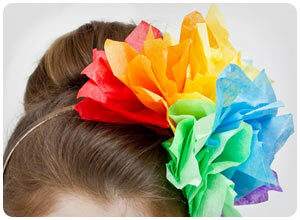 Be sure you’re dressed for the part with a fun and festive rainbow fascinator. Make it yourself using tissue paper and a skinny headband. It’s a quick and easy accessory you can make for yourself or your kids in time for the party. 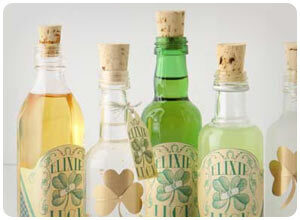 Homemade Leprechaun SpiritsAn easy way to create a fun atmosphere for your party is to create homemade leprechaun spirits, with clever names and vintage style labels. 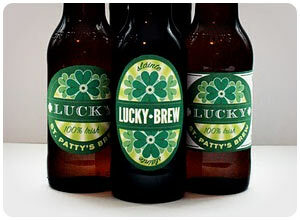 Use green bottles if you have them, add the St. Patty’s Day themed labels. Then add corks to the top of each bottle. You can use real spirits for an adult party, or use green juice and soda for the kids. 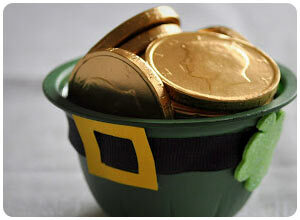 St. Patrick’s Day Treasure HuntPlan a fun treasure hunt for the kids to do at your St. Patrick’s Day party. This is a perfect activity for younger kids, because the shamrocks are easy to follow and there aren’t too many complicated clues. 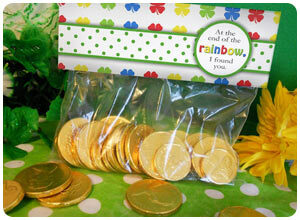 At the end of the “rainbow,” have a fun prize such as a pot of chocolate coins waiting to be found. 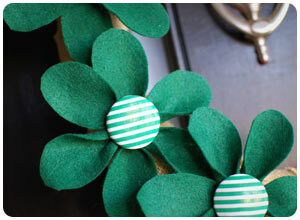 Shamrock GarlandA shamrock garland is a quick and easy way to bring some St. Patrick’s Day cheer into your home. You can use a garland to decorate various rooms and to adorn shelves and mantels. For a party with children, you can even make this into a fun activity for the kids. 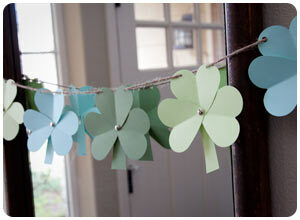 Display the garland during the party, and then have each kid take home one of the shamrocks they made. Ribbon WreathDecorate your doorway with a green and white ribbon wreath to add some holiday cheer to your home on St. Patrick’s Day. This is also a great way for your guests to know which house is yours: when you invite them to the party, if they haven’t been to your house yet, tell them to look for the door with the St. Patty’s Day wreath. 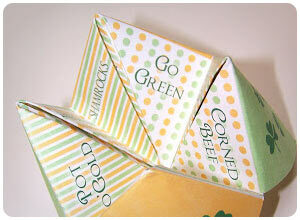 St. Patrick’s Day Fortune TellerLooking for a fun activity to do at your St. Patrick’s Day party? A holiday themed fortune teller is a perfect way to have your guests laughing and having tons of fun. Print out a free pre-made “cootie catcher” or design one yourself. This is a fun activity for both kids and adults. St. Patrick’s Day CakeWhen you think of cake, you think of birthdays, but who says you can’t have cake on St. Patrick’s Day? A green seven-layer cake makes a perfect treat for the holiday. Use different amounts of green food coloring in each layer for a gradient effect. Or, make a rainbow cake with all different colors. 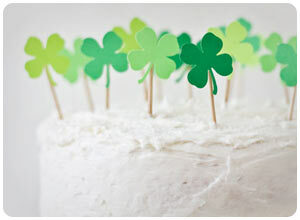 DIY Clover Patch Cake TopperIf your party is going to have a cake, you’ll need this DIY clover patch cake topper. 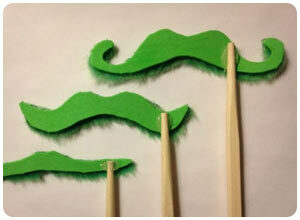 It’s easy to make by punching shamrock shapes out of green cardstock and then gluing them to individual toothpicks. 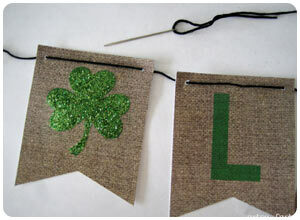 You can cut out the shamrocks, but it’s much quicker and easier if you have a four leaf clover “hole” punch. 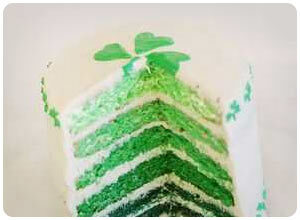 Simply stick the clovers on top of the cake. You can also use these on top of cupcakes. Leprechaun BeardAt your St. Patrick’s Day party, hand out a leprechaun beard to each of your guests as they arrive to wear during the festivities. This is a fun idea for both kids and adults. The beards are easy to make and they’re not uncomfortable or restricting, so your guests will be able to have fun wearing them throughout the party. 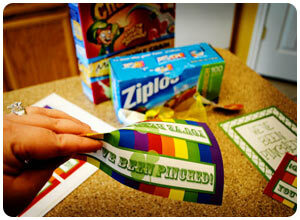 Shamrock Scavenger HuntA shamrock scavenger hunt is a perfect idea for a kids’ party. 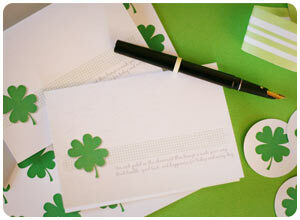 Create a number of shamrock props and add clues to the back of each one. 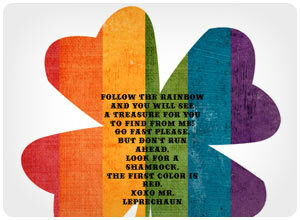 The clues should eventually lead to a prize at the finish (a pot of gold—or chocolate coins—at the end of the rainbow makes a perfect prize). You can even make this game adult friendly by having more difficult clues and a case of beer as the prize. 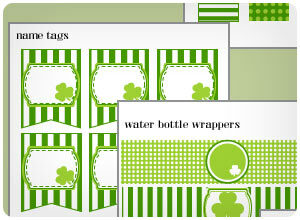 St. Patty’s Day Party PrintablesYou can use all kinds of pre-designed, ready to print St. Patrick’s Day labels, tags, signs, and wrappers to use at your party. This adorable (and free) printable contains just about everything you need for your party, including yard stake signs, candy bar wrappers, party circles, name tags, food tents, cupcake wrappers, a welcome sign, water bottle wrappers, and more. 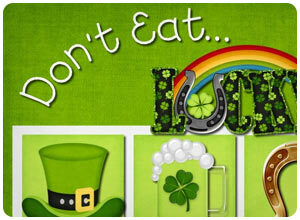 Don’t Eat LuckyDon’t Eat Lucky is a fun St. Patrick’s Day twist on the old Don’t Eat Pete game. This is a great activity for a holiday party, whether in the classroom or the home, and for both kids and adults. For kids, have some candies or other small sweet treats on hand. For a party with your fellow adults, you can make the game more adult to match by using some spiked drinks in small Dixie cups or shot glasses instead of candy. St. Patrick’s Day MantelFor a holiday party at the house, the mantel is the best place to showcase the theme. Add some fun St. Patrick’s Day themed decorations to your mantel, especially if your guests will be congregating in the living room or family room throughout the party. 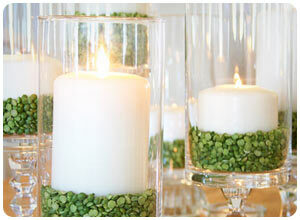 Use framed prints, green décor, banners or garlands, and anything with green hues. DIY Lucky PoppersWho said confetti was only for New Year’s? 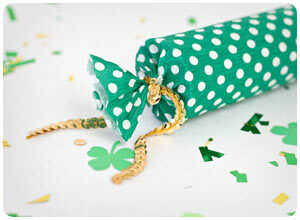 For your St. Patrick’s Day party, you can make your own lucky poppers filled with green and gold confetti that you make yourself. 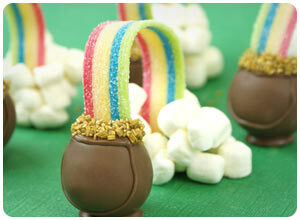 You and the kids can have fun making the lucky poppers, and your guests will have a ton of fun using them. St. Patty’s Day Beer LabelsFor an adults’ St. Patty’s Day party, dress up all your beers and wines with fun St. Patrick’s Day themed beer labels. Encourage friends to bring their favorite beers and wines, and have some labels ready to use. Or, for a kids’ party, slap these fun labels on their favorite sodas or water bottles. For clear sodas and water, you can add some green food coloring ahead of time to make it even more festive. Pinching PartyEveryone knows that you’re prone to pinching if you don’t wear green on St. Patty’s Day. Turn playful pinching into a fun and sneaky activity with some Pinched printables. 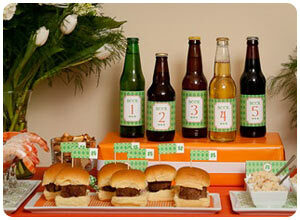 It’s great fun for both kids and adults, and it can add another level of fun to your St. Patrick’s Day party. Chocolate Covered Pretzel FavorsWhen the party is winding down to a close, it’s fun to give your guests a little treat to say “thank you” for attending and to remind them of how much fun they had. 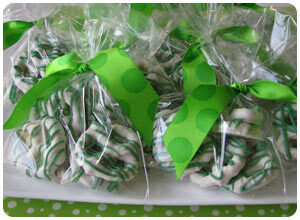 For a St. Patty’s Day party, candies and other sweet treats make a perfect party favor. Whip up a batch of chocolate covered pretzels, wrap them up, and send your guests home with their goodie bags. St. Patrick’s Day Treat ToppersEvery great party ends with guests taking home a party favor. 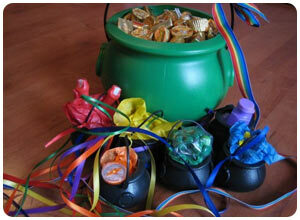 Use a cute St. Patty’s Day treat bag topper for yours. They’re easy to make when you use the free, pre-designed template, and you can use them for both kids’ and adults’ parties. Gather some candies or trinkets, wrap them up in little plastic bags, and add the treat topper for quick, easy, and cute party favors.